Stephen Maguire and John Higgins are both through to the last 16 at the Dafabet Scottish Open. There was however an end to the fairytale for Wishaw youngster Chris Totten as he bowed out to one of the world’s best – Neil Robertson. The Australian’s class told in their third-round encounter, with breaks of 79 and 56 helping him to take the first two frames. Robertson then edged the third before compiling a break of 97 in the fourth to settle the contest. Despite the defeat, 19-year-old Totten has caused a stir at the tournament at Glasgow’s Emirates Arena with upset victories over Wales’ Sam Baird and England’s Mitchell Mann in previous rounds. Totten said: “I kept creating chances and my safety was really good but every time I got in the table felt a lot different in this one. “I know Neil’s [Robertson] not in the top 16 now but he’s a top-eight player every day of the week so he just took his chances and that’s all you can say about it – better luck next time. Totten heads to the D88 German Masters qualifiers in Barnsley next week but there was better news for his more experienced compatriot and fellow Wishaw man Higgins. 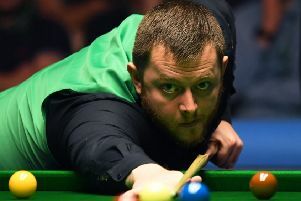 The world No 5 triumphed 4-0 over Northern Ireland’s Gerard Greene in their third-round match on the afternoon of day four. Higgins is ranked 88 places above Greene, and that showed as the Scot won comfortably 70-12, 72-29, 132-0, 113-0. The 42-year-old will now face Ashley Hugill, 23, in the last 16 after he came through an all-Yorkshire match against Peter Lines. Having reached the final last year, Higgins is one of the favourites for the tournament but if he is to win he’ll have to overcome an in-form Ronnie O’Sullivan. The Englishman, fresh from winning the UK Championship last week, edged through his third-round encounter with Li Hang 4-3. O’Sullivan started superbly before faltering, and appeared to rest his eyes at times, before turning things round to take the final two frames. Higgins and O’Sullivan were joined in the last 16 by Glasgow’s Maguiret. The world No 18 has been in good shape so far as he chases both the £70,000 prize and Stephen Hendry trophy. Maguire beat Alex Borg 4-0 before downing Hamza Akbar 4-2 in round two, and beat Yan Bingtao 4-3. The 36-year-old was down 3-2 at one stage, but rallied with breaks of 78 and 91 to set up a fourth-round match with Chinaman Xu Si.